A few weeks ago, I received an email from a Martha White® Muffin Mix user who wanted to know if she could make banana bread with Martha White Banana Nut Flavored Muffin Mix. Well, the truth is that over the years, I have made several versions of fruit bread loaves with muffin mix, but I couldn’t remember if I had ever simply mixed up according to package directions and baked in a loaf pan. So I decided to try it. I sprayed an 8-1/2 x 4-1/2 x 2-1/2-inch loaf pan with non-stick cooking spray and mixed two pouches of Martha White Banana Nut Flavored Muffin Mixes with 1 cup milk. I baked it at 375°F for 35 minutes and let cool in the pan for 5 minutes before turning out. It was really good! Moist and delicious with a typical nice crack in the top. Now I was on a roll, so I baked one of my favorite “dressed-up” muffin mix loaves – Chocolate Chip Sour Cream Snack Loaf. It is delicious, too! With the addition of sour cream, vegetable oil and a couple of eggs, the loaf is very moist with a soft cakey texture. And it worked just as well with Banana Nut Flavored Muffin Mix and Blueberry Flavored Muffin Mix, too. So the good news is, whether made by following the package directions or with adding extra ingredients, muffin mixes are a convenient shortcut to a variety of loaves you can stir up in minutes. What’s in Your Pantry for Winter? Do you ever wish you had a quick, warm dessert for supper or to serve unexpected company? You’re in luck, this is exactly what I had in mind when creating the “What’s in Your Pantry?” series. Wouldn’t it be comforting to know you have the ingredients on hand to create a quick and easy recipe anytime? A warm fruit crisp is just the thing on a cold day. Homey and casual, it’s perfect for a family supper or to serve company. Below are two suggestions for crisp recipes you can whip up at the last minute. When making these suggestions, I try to keep in mind the ingredients you probably always have on hand. We loosely interpret pantry to include common refrigerated ingredients and those easily kept in the freezer. For these recipes, I’m assuming you have oats, brown sugar, butter, maybe pecans or other nuts, dried cranberries or raisins, and of course a few packages of Martha White® muffin mix. If so, all you need is a couple of cans of pie filling and frozen fruit. For the Cherry Berry Crisp, you’ll need a fruit flavored muffin mix. The recipe calls for Wildberry, but a Blueberry flavored mix would also be good. Use an Apple Cider flavored muffin mix for the Apple Cider Crisp. The recipe calls for dried, fresh or frozen cranberries, but you could also substitute raisins in place of cranberries. Posted on January 30, 2017 February 7, 2017 Author lindacarmanblogCategories Martha White, Southern Pantry, What's in your pantryTags crisp, muffin mix, pantry ingredientsLeave a comment on What’s in Your Pantry for Winter? In its basic form, bread pudding is bread (sometimes stale) soaked in a mixture of eggs, milk or cream and sugar. Baked to creamy perfection, bread pudding is another testament to the creative genius of cooks using the ingredients they had on hand. Last summer we talked about the Southern version, Summer Biscuit Bread Pudding – delicious in its simplicity. Although often made with chewy yeast bread, bread pudding may be made with any bread, even muffins or fruit breads. If you ever have leftover muffins, simply freeze until you have about a dozen. More than likely you won’t have leftovers, so mix up a couple packages (any flavor) of Martha White® Muffin Mix and prepare according to package directions. The Blueberry French Toast Bread Pudding with Smoky Bacon recipe is perfect for a spring brunch. Melding flavors of blueberry muffins with a rich maple flavored custard and pecans are sure to take this bread pudding French Toast recipe to the next level. This decadently delicious White Chocolate Banana Bread Pudding is a former recipe contest winner. Banana bread made from Martha White Banana Nut Flavored Muffin Mix is a tasty, but quick version of banana bread which also forms the base of the bread pudding. The rich custard is made with white chocolate baking chips. Top it all off with caramel topping for a crowd-pleasing dessert you’ll be asked to make time and time again. Many families are challenged to get a home cooked meal on the table each day. We’re all running in one-hundred different directions – from school to the dentist, dentist to baseball practice, baseball to dance – and by the time we get home, an hour in the kitchen just isn’t realistic. But the truth is, home cooked meals are something our culture needs now more than ever. We need an opportunity to gather as a family, to listen to our kids and hear about their days and chat with our spouses. Most importantly, we need time to just be a family and sitting down to a home cooked meal offers that opportunity. It doesn’t matter what’s on the table, but that we sit down to eat the meal together. I love Martha White® because it makes getting delicious food on the table easy. The amazing muffin mixes make breakfast a snap and with just a little ingenuity they also help us create delicious desserts. Start by preheating the oven to 350°F and spraying an 8×8 baking dish with Crisco no-stick cooking spray. Then empty the can of apple pie filling into the dish and spread it evenly. Next, sprinkle the sweet potato muffin mix over the apple pie filling. Melt the butter and drizzle it evenly over the muffin mix. Now top with the chopped pecans. Bake for about 45 minutes or until set and golden brown. Serve warm. At the drop of a hat, could you find the ingredients to make a quick breakfast or snack for your family or an unexpected guest? Many of you probably could, but would you like a few new ideas? I’m assuming milk is a staple in your house and you have access to bananas, you can create a variety of quick treats with the addition of Martha White® Muffin Mixes and a jar of chocolate hazelnut spread. The recipe for Martha White® Banana Chocolate Hazelnut Muffins requires only a few ingredients. Mix-up a package of Martha White® Banana Nut Flavored Muffin Mix, remove 1/2 cup of the batter and stir in some chocolate hazelnut spread. Layer the batters into muffin cups and bake. The two batters create an interesting layered effect and great taste. Chocolate Chip Flavored Muffin Mix or Strawberry Flavored Muffin Mix can also be used to create other interesting flavor combinations. Substitute peanut butter for hazelnut spread and enjoy a wonderful outcome when mixed with the Banana Nut Flavored Muffin Mix. For a quick breakfast treat that can be eaten around the table or on-the-go, try Martha White® Strawberry Banana Pancake Wraps with Chocolate Hazelnut Spread. The pancakes are easy to make and may be made in advance. Place a thin layer of chocolate hazelnut spread on the pancakes, roll-up around a banana and you’re ready to go! Posted on October 23, 2015 December 6, 2016 Author lindacarmanblogCategories What's in your pantryTags breakfast, Martha White, muffin mix, quick and easyLeave a comment on What’s in Your Pantry? I really enjoy spending some quiet time in the kitchen baking something from scratch, but if time is of the essence, using a mix can be a quick and easy shortcut. Depending on your preference, we have a scone recipe for you. Scones are cousins of our beloved biscuits, so it’s not surprising that we have embraced these breads. American scones range from small, rich and dense to large, light and airy. For years I’ve been trying to figure out which style is right. I’ve come to the conclusion that scones are like biscuits – the perfect one is the one you like! 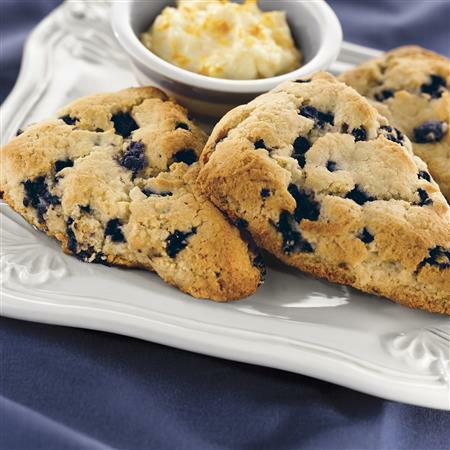 Our Fresh Blueberry Scone recipe makes a scone similar to a sweet, rich biscuit. Buttery, dense and bursting with fresh blueberries. The blueberries are added by sprinkling them over the patted-out dough. Then folding the dough a couple of times. This folding technique helps prevent the blueberries from bursting (most of the time) and makes the dough flakier. For an easier recipe version, use a Martha White® Blueberry Flavored Muffin Mix. Begin by cutting in the butter with a pastry blender and then fold in sour cream. Pat into a circle and cut into triangles with a pizza cutter or a chef’s knife. Cut the dough with a rocking motion like you use when cutting vegetables. We included a recipe that adds orange cream cheese as a complement, but you can never go wrong with butter. If you are eating gluten free, your friends at Martha White® have introduced three new gluten free muffin mixes! Martha White Gluten Free Sweet Yellow Cornbread and Muffin Mix. Martha White offers the convenience of a pouch mix by requiring two or less additional ingredients. The muffin mixes bake up in 12 to 13 minutes and the cornbread mix bakes up in 17 to 22 minutes. The Gluten Free Blueberry Flavored Muffin Mix and the Gluten Free Chocolate Chocolate Chip Flavored Muffin Mix are just right for a quick snack at breakfast or any time of the day. The Gluten Free Sweet Yellow Cornbread & Muffin Mix will be a blessing to go with those fresh summer vegetables. We have developed a variety of easy recipes from family-friendly treats to decadent desserts. *Ensure all recipes ingredients are gluten free by referencing the ingredient labels, as products may vary. If uncertain, contact the ingredient manufacturer. Posted on September 9, 2015 August 28, 2015 Author lindacarmanblogCategories UncategorizedTags easy recipes, GF, Gluten Free, Martha White, muffin mix, New Product, quick and easy, recipe ideasLeave a comment on Going Gluten Free?